Image caption Derrick Cooper had told the court the allegations against him were "ridiculous" and "fiction"
The ex-owner of a boarding school has been convicted of two charges of cruelty and assault against two boys. Derrick Cooper, who ran Underley Hall in Kirkby Lonsdale, Cumbria, had instilled "fear" at the school, his trial at Carlisle Crown Court was told. During the trial, Cooper had said he had not been responsible for any violent acts at his school for "maladjusted" boys. 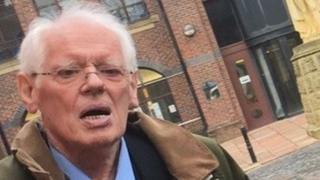 Former maintenance manager David Hadwin, 71, of of Raygarth Gardens, Kirkby Lonsdale, was also cleared of a charge of assault, occasioning actual bodily harm.